The following day – Saturday, 7 August 2004 – we headed back up into the hills for yet another acclimatisation trip. In order to tackle Mont Blanc, Eric and I were determined to get used to being above 3,000 metres / 10,000 feet. 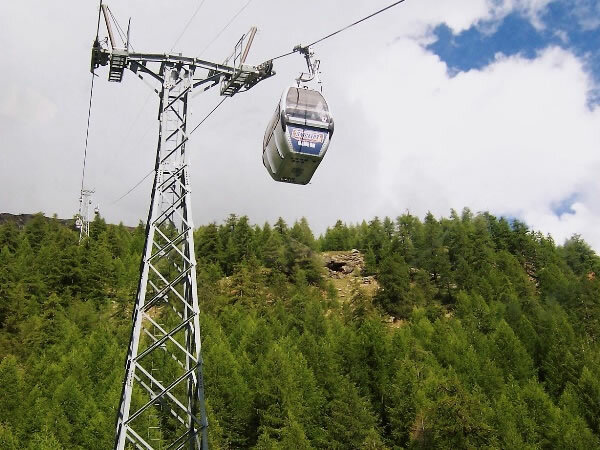 As a result, Eric, Roger, and I walked up Saas-Fee again and caught a cable-car to Hannig (which is situated at 2,350 metres / 7,710 feet above sea-level on the foothills of the alps on the western side of the Saas valley. This is a photograph of the view from our cable car as it climbed up towards Hannig.